10 июня 2015 г. в Женеве состоялся семинар о реализации Международного пакта об экономических, социальных и культурных правах в странах-членах Пакта, в особенности гарантированных Пактом права на образование, здравоохранение и социальную защиту. Семинар был организован неправительственной организацией OIDEL, которая является независимой платформой для правозащитных объединений, работающих в сфере права на образование. Семинар проведен во Дворце Наций ООН при поддержке Постоянного представительства Португалии при ООН, Специального докладчика по праву на образование, Университета Женевы, Центра международного права университета Манчестера, Университетского колледжа Анри Дюна. Участвовали 17 постоянных представительств при ООН, 15 представителей неправительственных организаций и университетов из разных стран. Поводом для проведения семинара послужила Резолюция 28/12 Совета по правам человека, в которой "подчеркивается важность эффективных средств правовой защиты в случае нарушения экономических и социальных прав, и отмечаются положительные меры, принятые для облегчения доступа к процедурам подачи жалоб и судебной защите на внутригосударственном уровне (п. 9), а также приветствуются законодательные и судебные меры, предпринятые на национальном уровне для реализации Международного пакта об экономических, социальных и культурных правах (п. 10). На основании сравнительного подхода, в ходе семинара проведено исследование исследования законодательной и судеюной практики различных стран и регионов в части реализации Пакта. Представитель ФЦОЗ, Мария Смирнова, выступила с сообщением о степени судебной защиты права на образование в России, привела примеры из судебной практики, свидетельствующие об учащении цитирования судами международного права, в том числе при решении дел, связанных с реализацией экономических и социальных прав, что приводит к повышению степени их защищенности за счет внедрения международных принципов. С полным текстом отчета о проведенном мероприятии на английском языке можно ознакомиться ниже. 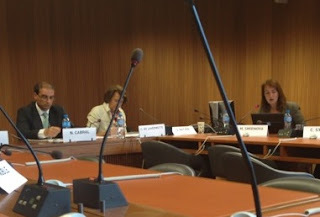 OIDEL, together with the Permanent Mission of Portugal, held a semi- nar on the Justiciability of Economic, Social and Cultural Rights (ESCR) at the Palais des Nations (Room XXVII) on 10 June 2015.This seminar was organized in collaboration with the Special Rapporteur on the Right to Education, the School of Medicine (University of Geneva), the Manchester International Law Centre (University of Manchester), the Collège Universitaire Henry Dunant and the NGO Platform on the Right to Education. The seminar on Justiciability of ESCR followed Human Rights Council Resolution 28/12 which “underlines the importance of an effective remedy for violations of ESCR, and in this regard takes note with appreciation of measures taken to facilitate access to complaints procedures and the domestic adjudication of cases, as appropriate, for victims of alleged human rights violations” (par. 9) and “welcomes the steps taken at the national level to implement ESCR, including the enactment of appro- priate legislation and adjudication by national courts” (par. 10). This seminar has shown, from a cross-regional approach, examples of the application of ESCR on a do- mestic level, particularly examples of jurisprudence concerning the content of ESCR. 17 Permanent Diplomatic Missions as well as 15 NGOs and Universities participated in this seminar. The event was moderated by Ms. Claire de Lavernette (Representative of OIDEL to the United Nations) and introduced by Mr. Nuno Cabral (First Secretary of the Permanent Mission of Portugal). The main speakers were Dr. Kishore Singh (Special Rapporteur on the Right to Education), Ms. Sandra Ratjen (Senior Legal Advisor of the International Commission of Jurists and member of the Board of ESCR-Net), Professor Emmanuel Kabengele (Professor of the Global Health Institute of the Faculty of Medicine of the University of Geneva) and Dr. Maria Smirnova (Researcher for the European Research Council project on the Sociology of Transnational Constitutional Law of the University of Manchester). Mr. Nuno Cabral wanted to first of all remind on this day, Portugal’s National Day, his country’s commitment to ESCR. He explained the link between democracy and ESCR, mentioning Portugal’s history as a good example of this since Portugal signed the International Covenant on Economic, Social and Cultural Rights the same year it achieved democracy. He then explained the problematics of understanding the essence and content of ESCR. The causes of these problems are neither a matter of academic capacity nor of diplomacy, they are rather the consequence of a lack of training of diplomats on this topic. It is for this reason and in order to solve this problem that Portugal co-sponsored this seminar. Dr. Kishore Singh (Special Rapporteur on the Right of Education) welcomed the initiative taken by this seminar in the framework of the Post-2015 Development Agenda and its implementation, especially in the domain of education. He then recalled that many countries do not recognise the right to education, nor its justiciability. - reducing the duration of legal processes, limiting the costs of litigation and providing legal assistance. He further mentioned that one of the problems of ESCR – such as the right to education – is the lack of their definition. He recalled the importance of detailing the content of these rights in order to conform the rule of law to ESCR. Along the same lines of what was said by Mr. Cabral, Dr. Singh encouraged judges, lawyers and other professionals to push the discussion of ESCR in the academic world. He also stressed the importance of both judicial and quasi-judicial mechanisms of justiciability, and the need to strengthen the second ones. The urgency of increasing awareness of what ESCR are is linked to the necessity of clarifying what justiciability means: these objectives could be reached through a better appreciation of the universality of these rights. He remarked finally that the important phenomenon of privatization of education is in part provoked by the fact that the states’ obligations have neither been well defined nor well applied. Justiciability therefore plays an inherently key role to move forward in the application of ESCR. Ms. Sandra Ratjen (Senior Legal Advisor of the International Commission of Jurists and member of the Board of ESCR-net) began her state- ment by reflecting on the existing prejudice against ESCR. She stated that many people consider ESCR as secondary rights. This is due to the fact that many Bills of Rights only recognize Civil and Political Rights. However, many new constitu- tions, as well as recent constitutional reforms, have included a comprehensive list of rights that include ESCR. A good example of this is the South African Constitution. Despite the barriers and difficulties many ways exist to litigate for ESCR. Ms. Ratjen stated that the lack of litigation for ESCR is only a myth. Proof of this is the massive jurisprudence of ESCR that can be found in a variety of countries with different legal and cultural traditions. She encouraged the audience to ￼check the database of the ICJ to verify the amount of jurisprudence available on this subject – www.icj.org. To illustrate her point Ms. Ratjen mentioned three examples of jurisprudence on three different ESCR in different countries. She first of all presented a Brazilian case from 2010 on the right to education. This example concerned the constitutionality of introducing race quotas in universities. In this case judges used ICESCR data. The second case she presented was a decision of the Supreme Court of New York from 1978. The case concerned a group of people whose health had been affected by poor living conditions in a hotel. The court recognized that the right to health of these people had been violated. The third case came from Hong Kong in 2013. The case concerned a migrant’s request to obtain social security. Law required he provide proof of 7 years of permanent residence to have access to social security provisions. In this case the court recognized his right to social security by arguing that the content of the relevant article of law was irrational and went against the core content of social security. Prof. Emmanuel Kabengele (Professor of the Global Health Institute of the Fac- ulty of Medicine of the University of Geneva) discussed the problems to guarantee and make effective those rights due to the difficulty of their justiciability. He explained that despite a long critic epistemological controversy of this right, some people still deny the justiciability of the right to health. The arguments speaking against its justiciability are its ambiguous definition, the high costs of its implementation and the conflict that exists between individual health and collective health. Prof. Kabengele explained however that there is a way to get beyond this problem globally. years. For instance, between 1990 and 2007 there have been 90.000 judicial pro- cesses concerning the right to health in Colombia. Moreover, in the state of Rio Grande do Sul (Brazil), lawsuits against the state over health responsibilities have increased by more than 1500% in 7 years. - the high costs of judicial procedures. Finally, Prof. Kabengele mentioned three necessary elements to ensure the jus- ticiability of the right to health: 1st. the inscription of the right to health in consti- tutions and domestic legislations, 2nd. the social mobilization for the protection and advocacy of ECSR, 3rd. international cooperation and solidarity on this do- main. Dr. Maria Smirnova (European Research Council project on the Sociology of Transnational Constitutional Law of the University of Manchester), after quoting relevant examples in the field of the rights to education and health, provided a framework of the justiciability of Economic, Social and Cultural Rights in the Russian Federation. Despite the ratification of international instruments and the constitutional recognition of ESCR, individuals should be granted further minimum entitlements referring to them. The implementation of these principles is however limited by obstacles that undermine their full realization. She then explained the situation of the justiciability of the right to education and the right to social security in the Russian Federation. One of the most common reasons of exclusion from the enjoyment of these rights concerns residence registration. While ESCR should be recognized and applicable to everyone, acts of discrimination are committed (as for example in the application of social security measures or in the access to education) towards those who do not have residence permits. Russian courts pronounce many sentences on this domain. In the field of education, there have been many debates concerning the place of cultural, linguistic and religious identity within education. This is due to the fact that public education is secular. Alternative education (such as confessional education) is only offered in private educational institutions. Also, one of the most common violations concerning the right to education is due to the lack of security. Dealing with the right to health, Dr. Smirnova provided a clear example of violation of this right: people affected by certain illnesses (such as HIV) are forced to leave the country. The court, by using international law and principles as a legal basis in these cases, made it however possible for those who have a family to stay in the country. Indeed, their forced displacement would have represented a violation of their rights. The Supreme Court has also made some progress in providing facilities and implementing ESCR for workers and disabled people. Dr. Smirnova concluded by highlighting how the recent jurisprudence of the Su- preme Court has taken a step forward in ensuring the respect and application of ESCR. Furthermore, she stressed the persistence of the Federal government to have courts apply international principles and legal instruments. The utilization of those instruments has enabled the Supreme Court to avoid or reduce obstacles to the full implementation of such provisions lacking in domestic rule. Mr. Christian Courtis (Office of the High Commissioner for Human Rights) summarized the relevant aspects of what had been brought up in the discussion so far, giving his interpretation of various questions dealing with the definition of both justiciability and the content of ESCR. Firstly, he pointed out that the distinction between ESCR and Civil and Political Rights is not relevant to define the justiciability of ESCR. As the other speakers explained, the two kinds of rights are interrelated and affect each other mutually. This link emerges in the judicial arena, where cases dealing with one group of rights often imply a reference to the other. This close relationship is also demonstrated by the instruments of justiciability. In both cases a variety of approaches is available and reference is made to international principles and laws to judge violations. Secondly, he defined justiciability as going beyond the mere assessment of violations: it is a process dealing with creativity. Concerning the interaction between domestic and international law, Mr. Courtis pointed out that international law is not the legal roof, but the legal base and that the role of domestic law is to develop the content of international law to ensure justiciability. This can provide better results if those characteristics are observed. Finally, he concluded by mentionning some requirements that must be observed to realize justiciability in its most genuine significance: 1st. the accessibility for all, especially for those who are often left behind, 2nd. the adequacy of available remedies, 3rd. the possibility of creating mechanisms to set up and follow up the implementation of court decision. ￼Following this discussion, relevant questions were asked by the representatives of States attending the meeting. Among them were the representatives of South Africa and the Russian Federation who thanked the Permanent Mission of Portugal and OIDEL for the organisation of the seminar. The representatives asked Dr. Smirnova to explain the difference between the justiciability of ESCR and that of Civil and Political Rights. Dr. Smirnova and Mr. Courtis agreed that the difference lies in the procedure by which both kinds of rights are judged. The most accessible systems of justiciability are those relating to administrative issues, which themselves frequently relate to Civil and Political Rights. However, efforts have been made to encompass ESCR in administrative protection mechanisms. A second question was asked by Mr. Xavier Du Crest (Aide et Action International) and addressed to Prof. Kabengele. The question concerned the ongoing process of privatization of education and the threat it represents for society. Dr. Kabengele replied that while a risk does exist, privatization has both positive and negative aspects. A balance must therefore be found. In doing so, states must however never forget their core obligations. It is the role of the state, in elaborating policies, to ensure harmony between its obligation to rule and the possibility for other stakeholders to fulfil the aforementioned right. Mr. Philippe Richard (OIEC) reminded the importance of judiciability in order to ensure education as a public good. He said that as long as education was understood as a political and economic tool rather than as a right with legal consequences for those violating it, education will not be considered as a public good or right. Ms. Caroline Staffell (Graduate Women International) also made some remarks mentioning the importance of international instruments in facilitating the justiciability of the right to education. In this sense, the General Comment n°13 as well as the Vienna Declaration and Program of Action have to play a more important role to ensure the essential content of the right to education. Finally, Mr. Stefano Nobile (Caritas Internationalis) stressed the importance of the role of NGOs and civil society in building a favourable environment for justiciability through actions of cooperation.